Electronics giant LG has partnered with mapping services provider HERE, in a big to enter the bustling autonomous cars market. The two companies will work together on developing telematics solutions for autonomous cars. LG and HERE will combine their respective expertise in advanced telematics and high precision mapping and location data. Telematics, as an industry, deals with integrating telecommunications with informatics to provide services such as navigation, entertainment and more using technologies such as GPS, Bluetooth, WiFi and DMB (Digital Multimedia Broadcasting). LG has been one of the frontrunners of the telematics industry since 2013, and is now looking to merge its expertise with location data from HERE Open Location Platform in order to develop a robust, central hub of information that can be utilised by the fast growing autonomous car industry. How HERE comes into play in this endeavour is its intellectual property, under which it is developing an ‘HD Live Map’ in collaboration with major car manufacturers. The ‘HD Live Map’ is a cloud-based map that has information about roads, lane markings, stop signs, crossings and traffic lights. LG’s planned offering, developed with HERE, will provide automobile makers complete telematics solution. 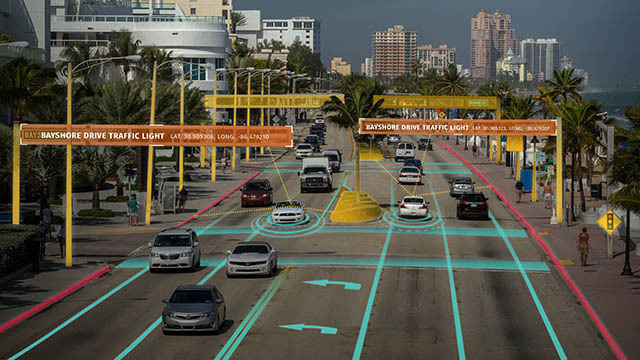 Cars utilising this system, will use their ADAS (Advanced Driving Assistance Services) to collect information on the road, along with information on cars surrounding them using the V2X (Vehicle to Everything platform). This information will then be sent to the cloud, where LG and HERE’s telematics solution will repeatedly analyze it and send customized driving information to the car, after processing this data. The companies will have a tough fight on their hands as other service providers enter the telematics data market. It is after all a critical point in the growth and innovation in autonomous car industry, which has already seen a huge growth this past year.